Examine your breathing for a minute. Are you breathing through your nose or mouth? Is your mouth open or closed? Is your tongue on the bottom or roof of your mouth? Optimal breathing should be effortless and quiet through the nostrils with the tongue suctioned to the roof of the mouth behind the front teeth and the lips should be gently closed. Nasal breathing positively affects swallowing patterns, chewing, speaking, voicing and body posture. If nasal breathing is compromised for any reason, orofacial myofunctional disorders and/or airway function disorders may arise. This article focuses on descriptions of airway function disorders, including pediatric obstructive sleep apnea, and treatment options. AFD occur when the airway function is obstructed at any level of the airway, affecting a range of human functions. Sleep disorder breathing such as pediatric obstructive sleep apnea, is a collapse at any level of the upper airway resulting in abnormal breathing during sleep. Pediatric sleep apnea will be discussed further in this article. 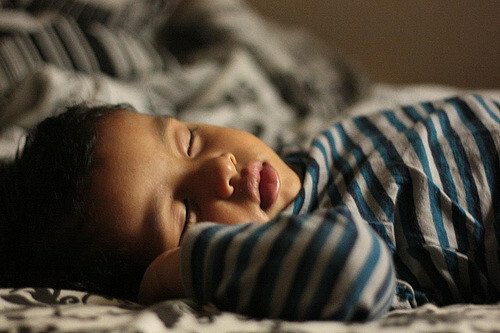 Sleep disordered breathing is initially impacted by daytime breathing specifically in children who mouth breath. Airway function disorders may impact a variety of functions in a child’s life. It may interfere with language development, learning and academics, memory, attention, socialization, and self-regulation. Children with AFD may exhibit primary behavior characteristics of excessive fidgeting, hyperactivity, decreased attention and emotional outburst. AFD may also impact a child’s speech and swallow function. Some children with AFD present with an interdentalized (tongue between teeth) on the following sounds /s, z, t, d, n, l/ as those sounds are produced with tongue elevation. Children may also experience abnormal swallowing patterns such as tongue-thrust swallows or impaired chewing. Reflect on your quality of sleep the past few nights. Did you sleep soundly through the night without any disturbances and wake up rejuvenated, or did you toss and turn all night feeling distracted and lethargic in the morning? The quality and effectiveness of a good night’s sleep impacts your mood and productivity the following day. The same holds true for children; if a child experiences disturbances throughout the night, they may demonstrate difficulties in behavior and attention during the school day. Studies have suggested that as many as 25% of children diagnosed with attention-deficit hyperactivity disorder may have symptoms of obstructive sleep apnea. How prevalent is OSA in children? Studies have shown that up to 5% of children are diagnosed with OSA, with a correction between pediatric obesity and OSA. The most prevalent symptom of OSA is snoring. Although some children may only demonstrate habitual snoring which consists of vibration of airway tissue with no airway obstruction, studies have found a ratio between 3:1 and 5:1 between symptomatic habitual snoring and obstructive sleep apnea (OSA). The first step to treatment of airway disorders is to determine the function of the nasal airway. Determining structural or physiological barriers to nasal breathing is necessary to determine plan of care. An evaluation by an allergist and otolaryngologist (ENT) is necessary to determine if medications such as antihistamines, allergy medicine or surgery is required to be able to safely breath out of the mouth. Elimination of non-nutritive sucking is important for adequate growth and formation of dental structures. Non-nutritive sucking (e.g. pacifier, finger, and object sucking) is a risk factor for future dental occlusion abnormalities. Orofacial myofunctional therapist can provide strategies to eliminate the use of nonnutritive sucking. Establishing adequate oral rest posture would be the next step of therapy. Orofacial myofunctional therapy focuses on retraining the muscles to stabilize a normal rest posture between the tongue, lips, teeth and jaw. Orofacial myofunctional therapy uses oral tactile stimulation and resistance activities to help disassociate the tongue from the jaw, improve lip closure and strengthen tongue elevation. Once the resting posture has been achieved, orthodontics may be recommended for dental stability if the child presents with a malocclusion of crossbite, overjet, or underbite; this might include braces, retainer, or rapid palatal expansion depending on the occlusion. In cases of pediatric sleep apnea, the first treatment step is typically the removal of the adenoids and tonsils. As reported by American Sleep Apnea Association, the removal of the adenoids and tonsils results in complete elimination of pediatric OSA symptoms in 70-90% of uncomplicated cases. As previously mentioned, a dental evaluation should be performed to check for hard palate development to accommodate the child's tongue. If necessary a rapid palatal expander (a non-invasive fixed and/or removable dental device) can be worn for six months to one year, to expand the transverse diameter of the hard palate.The next treatment option to consider is positive airway pressure, or PAP, which is typically used as a palliative treatment for adults with sleep apnea. A PAP machine blows pressurized air into the child’s mouth to counteract the closing of the throat during sleep. The amount of pressure is determined through an overnight sleep study. If you feel your child exhibits any of the symptoms listed above for an airway function disorder, speak with your primary care physician for adequate referrals to airway specialists. At Lumiere Children’s Therapy, our speech-language pathologist can treat speech sound disorders, swallowing disorders, and oral motor deficits associated with AFD. Capdevila, O. S., Kheirandish-Gozal, L., Dayyat, E., & Gozal, D. (2008). Pediatric obstructive sleep apnea: complications, management, and long-term outcomes. Proceedings of the American Thoracic Society, 5(2), 274-82.